Until cancer shifted things in a different direction, climbing was one of the joys of my life (and the memory of some climbs – not just images but an almost tactile replay – is still a joy). Even though my skill level never got beyond “moderate” – as someone (Jeff Lowe?) said, “The best climber is the one having the most fun.” I’ve had fun. The route High Exposure at the Gunks. When you make a difficult move, there is a joyous intensity of focus as your gaze narrows down to the little nubbin where you will – oh, so precisely – place your foot. When you squirm out of a tight place and, with one bold swing, come out into the freedom of the open rock above, it is a kind of rebirth. And of course the glow of the sunset is reflected in your heart from the high exposure of the topmost belay. As a climbing team works its way up the buttress, they form a little community, clinging on – through their own skill and mutual trust, and through technology that they have brought with them – to the surface, the boundary between rock and air. In fact, that is what all of us are doing all the time. The livable part of our planet is a thin skin, a boundary layer between dead rock and dead space. Maybe 10 miles thick – that’s a generous estimate – compared to the 4000 mile radius of the earth and the over 200000 miles from the earth to the moon, our nearest astronomical neighbor. We are clinging to the skin of the earth. Is it not a holy place? 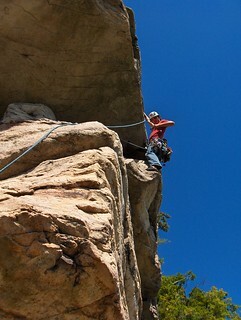 Below you will find links to various writings of mine about climbing, hiking and other outdoor activities. Some of these link lists are automatically generated by looking for blog postings with specific keywords, while others are curated by hand.